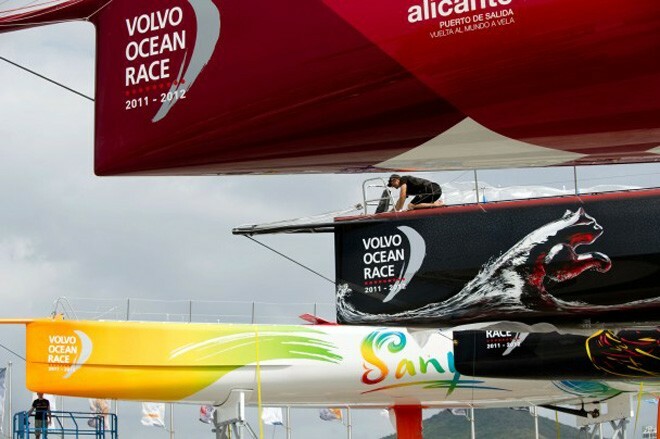 The Volvo Ocean Race fleet are having aerospace technology, which is designed to identify small structural defects, applied ahead of what could be two of the most brutal legs. Every Volvo Open 70, except Groupama 4, is being scrutinised with ultrasound technology by the founding owner of Q.I Composites Stefano Beltrando, who pioneered the application of the science in the marine field 12 years ago. Groupama have their own in-house ultrasound solution. Beltrando and a colleague are spending about two days per yacht checking the main problem areas including the hull, bow, keel, dagger boards, rudder and mast. The pulse echo can detect defects as small as a two-centimetre delamination, which could prove race-ending during the 39,000 nautical mile offshore challenge. Beltrando said that during the 2008-09 race, when he worked with teams including the winners Ericsson 4, defects were found on every boat at every stopover. He said that the constant push for the boats to become lighter and faster meant there was no extra protection. Like most, Beltrando reckons that the line-up of the 2011-12 is more competitive than ever before. It is an opinion he has formed having worked intimately with the second generation yachts in 2008-09 and with teams including Team Telefónica, Puma Ocean Racing powered by Berg and Camper with Emirates Team New Zealand since their construction began for this edition. Beltrando said there were some obvious changes and advancements in design and composition of the new-age fleet. ‘The main difference is that in this generation the quality of the building is very high and it has levelled out between the teams,’’ he said. ‘Last time Ericsson 3 and Ericsson 4 were at a higher level of construction. This time they’re all really nice boats. Beltrando and his colleague were spending Thursday finishing their examinations of Telefónica and Abu Dhabi Ocean Racing’s Azzam. By mid-afternoon in China the two were starting work on Camper and Sanya. The ultrasound is part of several major operations that shore crews are completing this week before their yachts are returned to the waters of Sanya Bay early next week. The DHL Shore Crew award for Leg 3 will be announced next week.